The March for Science is in support of science-led policy in the US. March: Will coincide with Wasington DC event. 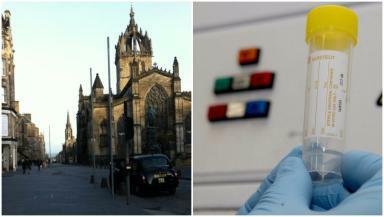 Thousands of scientists, academics and others are to take part in a rally in support of science in Edinburgh. The March for Science backs science-led policy-making in the US, which the group says is under threat. Almost 400 March for Science initiatives in 36 countries have sprung up since President Donald Trump was elected to the White House. The campaign in Scotland will culminate in a march and rally in Edinburgh on Saturday April 22. The exact location is yet to be confirmed. Trevor Sloughter, who is doing a PhD at the University of Strathclyde on mathematical modelling of the Arctic Ocean, said: "Everywhere you go in the world, there are barriers to people participating in scientific endeavours. "I'll be marching because this initiative is a show of unity and solidarity against every barrier, from government censorship to systemic injustice, to prove that science and knowledge are not just essential to society but rights for each and every human being." In Scotland the March for Science aims to celebrate and promote science and its diversity as part of everyday culture. It also aims to highlight how funding for science is important. The Edinburgh march is being held in solidarity with the March for Science in Washington DC on April 22. Robin Cathcart, an environmental scientist and mother of two who lives in Edinburgh, said: "Having been born in the US, I'm extremely worried about the suppression of facts and well-established evidence that is occurring there. "While the situation in the UK is clearly better, I'll be marching with my family on 22 April because I value the role science plays in our medicine, environment, and technologies." The event also coincides with Earth Day which takes place on April 22 this year. Lang Banks, of charity WWF Scotland, said: "Now, more than ever, the public and scientists, here and globally, need to stand together to defend science and science-based policy making. "The march in Edinburgh in April will be a family-friendly event, that everyone interested in celebrating and championing science should look to attend."